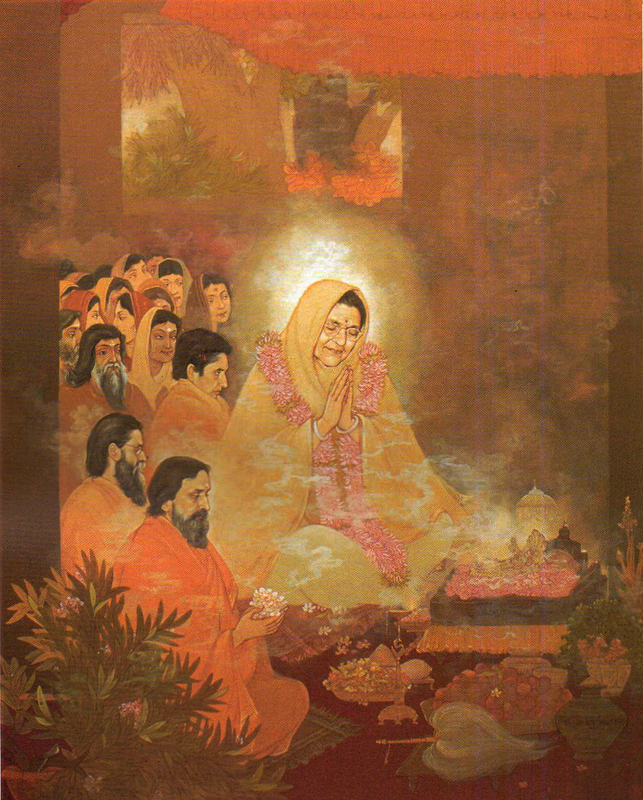 The ashram image of Padmanabha was consecrated on the Mahanavami of Durga Puja 1971. 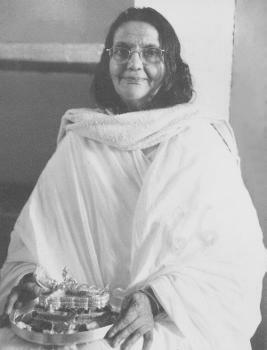 Swami Nirvanananda kept the image for daily puja until, after a short time, it was passed to Swami Bhaskarananda. In 1984 Padmanabha was passed to Swami Nirgunananda, who kept it for 17 years, until it was passed into the care of the ashram. The following accounts explain how Lord Padmanabha came to Sri Ma. They were written by H. H. Marthanda Varma, the Elia Rajah of Travancore. (Lord Padmanabha is the presiding deity of the State of Travancore, and the old ruling family are the servants of Padmanabha. They are related through edited excerpts from Ananda Varta magazine). “Both my wife and I had the privilege of Sri Ma’s darshan in Trivandrum in 1952, when Mother was touring the South. It was in the right hand pavillion in the grounds of Kaudiar Palace. At that time, both Swami Ramdas of Kanhangad and Rama Devi of Mangalore were in Trivandrum. This was a vision, but we understood little of what we had glimpsed. In July 1971, while we were staying in Bangalore, my wife saw an article on Mother in the ‘Illustrated Weekly of India’ and was eager to have Her darshan. It was possible to find out from friends in Bombay that Mother was at Hardwar. On Saturday, July 10th, 1971, my wife, daughter and I flew to Delhi and motored to Hardwar the next day. I went to Kankhal to find out when we could have Ma’s darshan. I was asked to wait and in a few minutes was given the joyful news that all of us could come to the Ashram at 9 p.m. Very soon we went inside for Mother’s darshan. She was seated on Her couch, with a few people sitting in front of Her on the floor. We did our pranamas, offered fruit and sat down. Peace and serenity pervaded the whole place. The next day we went to the ashram for darshan and later were served with great care and attention. When we returned to the ashram Mother told us that She would be leaving for Dehradun the next day. We were anxious to go to Dehradun as well and gracious permission was given. Thus we motored to Dehradun on July 12th, reaching the Kishenpur Ashram by midday. My wife and daughter we very near Mother’s room. I was allotted a cottage in “Kalyanvan”, the last one in the grounds. “The space between the heavens and all the quarters are filled by you alone.” The experience is very clear in my mind but I struggle to find words to convey what I saw. This wondrous sight was Mother—encompassing the boundaries of my vision fully and completely; Mother, magnificent, lustrous and universal; Mother in Her Mahima form but as always seen by us, and most remarkable was the radiance in and around Her hands in which She held Padmanabha Bhagavan. 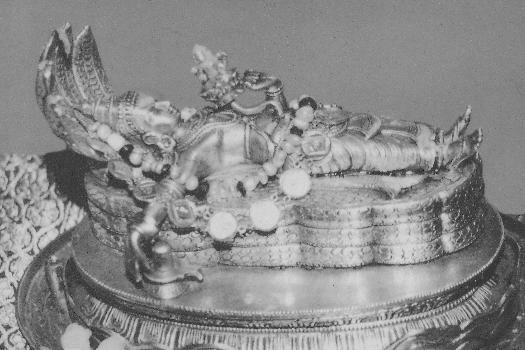 The image of Lord Padmanabha shows Lord Vishnu reclining on the many hooded snake Sheshna (Sheshnag), also known as Ananta (eternal). A lotus (padma) is shown growing out of his navel (nabha) with Brahma seated on it. Next to Vishnu’s right hand is a Siva Linga – hence the image represents the trinity Brahma, Vishnu and Siva. This experience lasted for about five to six minutes. I was thrilled and so profoundly at peace that I was able later to get the sleep of wonder and joy unalloyed. On July 14th, 1971, while still in Dehradun, I had a call from Delhi that I should go there to meet someone on the 15th. So we had to ask Mother’s permission to leave on the 14th night. On the 14th morning someone from the Ashram suggested to me to show my Bhagavans or Thakurs (Deities) to Mother. I asked for permission and was allowed to take my puja box to Mother’s room on the first floor of the Ashram. It was about 5.45 p.m. Mother was sitting on Her bed and I placed the box on the carpet and opening the box, started to take out its contents. When I was about to take out Padmanabha Bhagavan, Mother asked me to place Bhagavan not on the floor in the tray but on Ma’s bed, next to Her. I also put the other vigrahas there, namely Mahalakshmi, Sri Krishna, Ayyappa (Sastha), Ganeshji and Siva. For the next half hour I stood entranced as Mother adored the Bhagavans and when She got up She told me to pack the puja box only after She would go down to the hall. Thus after Mother left the room, I packed the box and went downstairs, took leave of Mother and departed for Delhi. 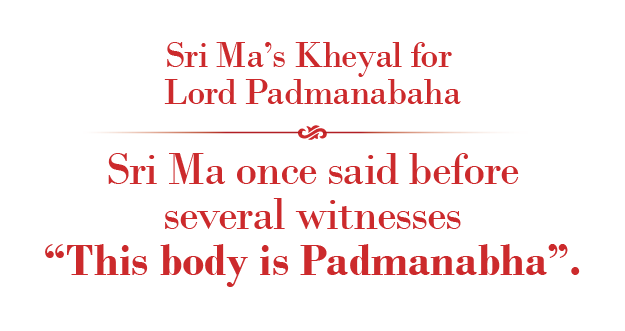 “This body is Padmanabha. Do pranam.” She also said that Padmanabha had not left, and showed some small footprints on her sheet). From the next day a snake came to the Ashram daily and when Mother was told about this, She said that Ananta had come and soon Padmanabha Bhagavan would also come. The snake used to come and do pradakshina (circumambulation) of the Panchavati, next door to Kalyanvan. As is usual in South India, a wax model was made and then covered in mud and then the wax melted away with hot water. Then the silver is poured and the mud cast broken up. Instructions were left to purchase the silver and keep it ready. But when I came to Bangalore on a Sunday morning, I found that the silver had not been procured. The casting was to be in the early hours of the following Monday morning. On a Sunday afternoon or evening it was not easy to get 6 kilos of silver. The markets were scoured and all of a sudden the required quantity of silver was found and bought. Next morning, at the proper muhurta (moment), it was cast and when, after cooling, the mud mould was removed, a perfect cast emerged. Padmanabha Bhagavan and all the other articles for the puja were got ready. Permission was taken from my brother to be absent at the Dussera as the installation (chal pratishta) of Padmanabha Bhagavan was all important. On the Saptami day of Dussera my wife was ready to leave for Delhi but due to a bereavement she was unable to do so. Since she could not go, I got ready. On the morning of the 29th I was in Dehradun and the astonishing things that happened there are well known. Mother was in mouna at that time. As soon as I arrived and had darshan, I was asked to go to a cottage in Kalyanvan and wait for Mother. In Her presence I unpacked the box and submitted the newly made image of Padmanabha Bhagavan. A procession was immediately organized and Mother, leading everyone, went to the cottage where I had stayed before and had the wonderful first experience. Bhagavan was kept and puja done where I had slept previously. From nowhere seemingly, all the requisites for a puja appeared and then Bhagavan was taken to the Durga Puja pandal. Bhoga had been prepared for all the Deities there as is the custom on all Durga Puja days. When Padmanabha Bhagavan was enshrined in the pandal, it was seen that there was an extra thali (tray) of bhoga ready for Him. Mother then remarked that Padmanabha Bhagavan had already begun to see to all arrangements for Him. The Chal Pratishta (installation) was performed by the Nambudiri pujaris from Trivandrum. 1971 September : First Pooja of Sri Padmanabhji, in the Ashram on Mahashtami day. On the 30th I was able to fly to Trivandrum from Delhi. It so happened that due to a difference in the calenders of North and South India, Vijayadasami that year was one day later in the South. So I was able to be present in Dehradun for the Chal Pratishta and also to get to Trivandrum for the Vijayadasami. “Everyone by now had come to know that I always have my puja box with me wherever I go and many had seen the, contents and there was a lot of silver. I was very concerned about the safety of the Deities, for after all the tents had only a moral protection. The very day we reached, I submitted my anxiety about this to Ma. This was on the 17th of November. It was about 6 in the evening when we had darshan after reaching Chandod from Baroda. Ma solved my problem and worry at once. She decided that before and after my puja was over in the mornings, the puja box was to be packed and kept in Ma’s own room and taken to my tent only for worship. So from the 17th to 25th Sri Padmanabha Swami and the other Deities were with Ma most of the time. The Murajapam festival which would conclude on the 14th of January, 1978. I prayed for Ma’s blessings that this 56 day ceremony should be accomplished auspiciously and with all propriety and grandeur and that Ma be gracious to bless my brother in this undertaking. Ma said that something should be done here in Chandod that day, that a lamp should be lit for Sri Padmanabha Bhagwan and that Bhaskaranandaji would tell me what was to be done. I had no idea as to where this lighting of a lamp was to take place : in my tent or in Ma’s Kutia or somewhere else. At about 5 p.m. Swami Bhaskaranandaji told me that Mother had told him that it was to be done in the pandal. At dusk, I went to the pandal and Sri Padmanabha Swami was kept in a silver tray on top of the puja box next to Mother’s asana. I lit a lamp and waited. When the hall was full to overflowing and the Mandaleswars and Mahants had been seated and Mother had also come, I was permitted and privileged to sit behind Sri Padmanabha Swami and Mother on the dais for the whole evening. “January 1975 found me in Naimisharanya. The experience did not happen to me directly nor was I in any way really connected with it ; but what it was all about was so much in keeping with my devotion, love, respect and reverence that I feel that I could lay at least a partial claim to its being my experience as well. Actually it is an Ashram experience and particularly Swami Bhaskaranandaji’s. It was related to me in hallowed Nimsar as Naimisharanya is now called. It was in the year 1971 that it had been my privilege to submit to Mother a Padmanabha Bhagwan in Dehradun during the Durga Puja of that year and if I could use a metaphor, a twin of the Padmanabha Bhagwan I have been doing worship to since 1946. When I had taken the Padmanabha Bhagwan for Mother to Dehradun, I had covered the Lord with a yellow cloth typical of Kerala, gold laced and with black borders and then packed the puja box.